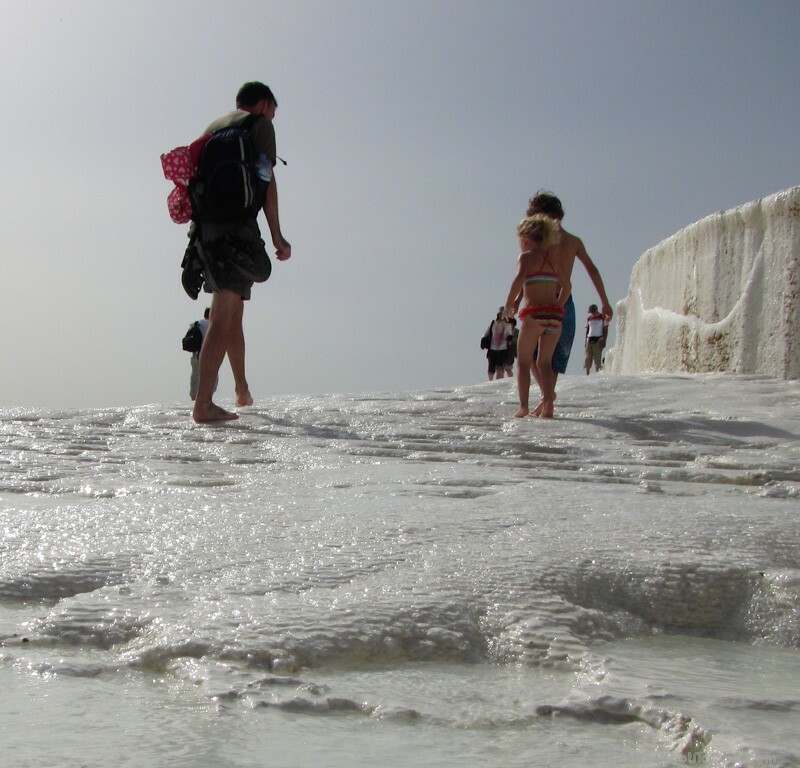 One of the things that drew us to Turkey was the chance to see the famous natural hot water travertines in Pamukkale. The Cotton Castle, as it’s known in Turkish, is aptly named and from a distance, its huge white slopes are more reminiscent of snow than rock. 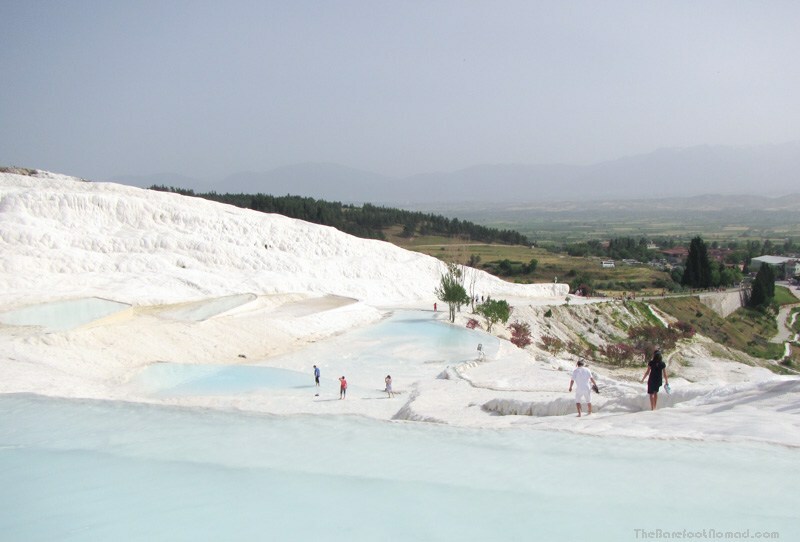 The travertines, with their glowing white natural hot pools terraced along a mountainside, are featured in almost every tourist brochure about Turkey and rightly so. 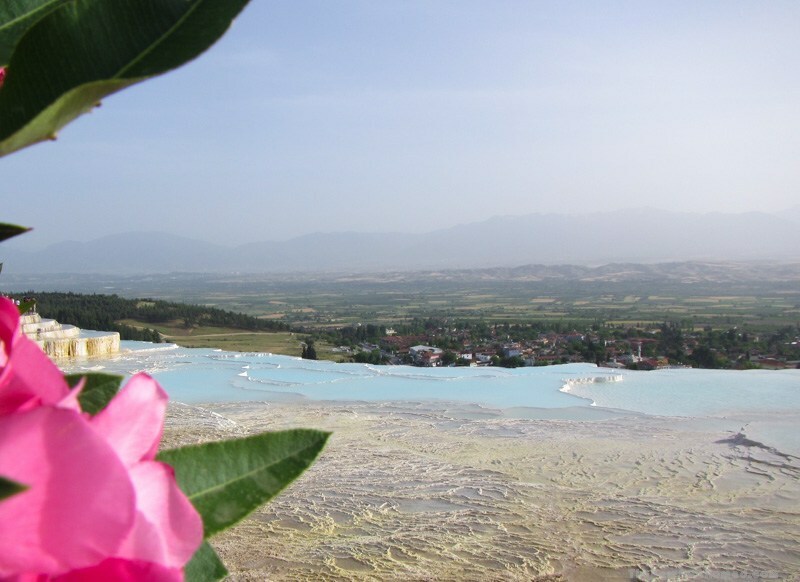 The pools are perched below the ancient city of Hierapolis (once frequented by Cleopatra and her ilk, and even mentioned in the Bible) and are a UNESCO heritage site. People have bathed in these pools for thousands of years. The pools are made when naturally occurring hot water bubbles up from under the ground. As it reaches the surface, the water percolates through a layer of limestone, dissolving calcium into the hot water. 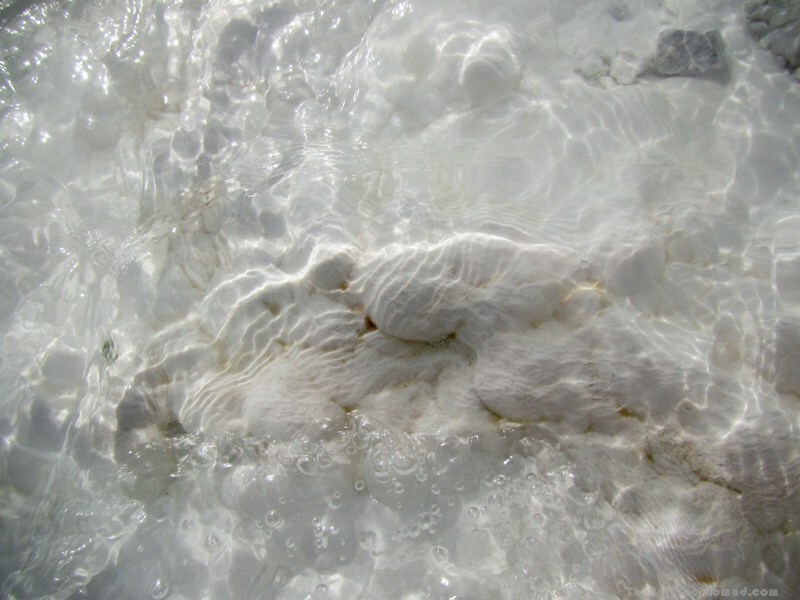 By the time the water reaches the surface, it’s chalky white with dissolved calcium, or more technically calcite (CaCO3), from the limestone. Years ago, tourists were free to roam wherever they wanted on the travertines, hotels were built at the top and a roadway was actually created so vehicles could drive up the bank to quickly reach the summit. As you can imagine, this led to some extensive damage. The Turkish government stepped in to prevent the site from being totally destroyed. The hotels were subsequently torn down and vehicles were stopped from driving on the site. Tourists are now limited to certain areas, and kept off the most fragile parts of the travertines. Today, there are a series of controlled shallow pools along the hillside where you can bathe in the hot water. The original naturally occurring basins, like those in the picture below, are off limits to bathers. You can still see traces of the damage that was done to the travertines before stricter regulations were in place. A section at the top of the hill is closed off, with many of the naturally occurring basins currently empty. 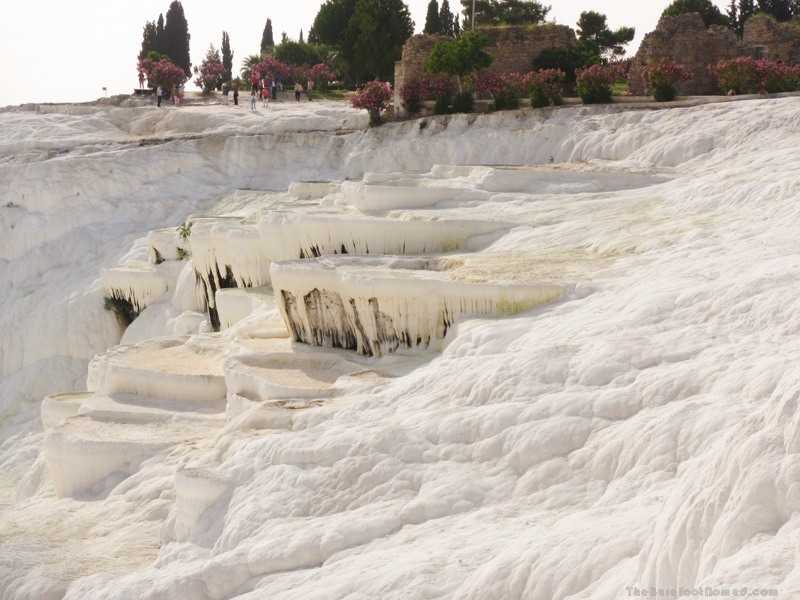 Aside from that one small section, many of the natural travertine terraces remain. We spent the majority of our time playing with the kids on the pathway up, in the pools they formed when the roadway was ripped out. I expected the pools to be filled with still water, but the entire hillside is covered with a thin layer of rushing warm water and though these particular pools were formed by man, the waters and the minerals have already claimed them as their own. You’ll understand why the place is named Cotton Castle as you look up from the pools as you climb the hill. Our kids kept calling it the Cotton Candy hills. Wherever the water is still, the white calcite deposits start to settle, creating a chalky gloop that’s a lot of fun to squish between your toes and fingers. All visitors must go barefoot when walking on the travertines. 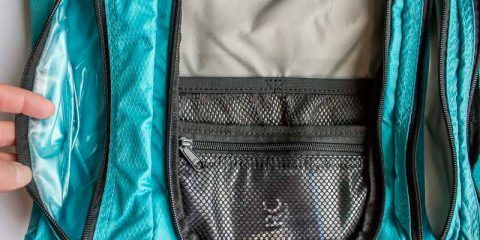 You’ll be expected to carry your shoes as you walk so a backpack or a string to throw them over your shoulder isn’t a bad idea. Some people just leave their shoes at the top, but if you’re coming from the bottom you’ll want them to explore the Hieropolis when you reach the summit. The bathing pools aren’t deep. The deepest of them is only a few feet deep, but many of the pools are only deep enough to get your bum wet if you’re sitting. 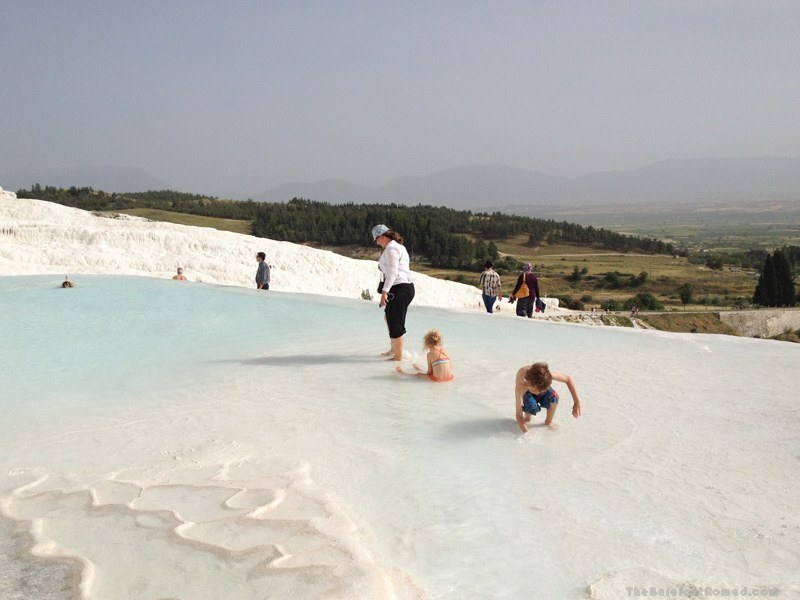 It’s a long, hot hike to the top of the travertines and Hierapolis, especially in summer. Bring along water, sunscreen and a hat. A fit adult should be able to hike one way up the hill in about 20 minutes, but that’s without any time stopping to enjoy the pools. Some of the surfaces are quite slippery (especially around the edges of the main pools), so you should take caution. Some areas where the calcium has already hardened can be a little hard on the feet as well, however there are usually smoother pathways you can find. Expect to get your feet wet regardless and note that the majority of the walk isn’t slippery at all. We had no trouble the day we went however we did see a few folks slip and fall around the pool edges. We did have to hold our four year old’s hand for some of the slipperier sections and carried her a time or two when she complained her feet were getting sore. If you’re not fit and healthy, or have limited mobility, you may have a lot of trouble walking up the travertines from the bottom. Entrance from the top at Hierapolis is less strenuous, though some sections are uneven and still relatively steep. Which entrance should I take? 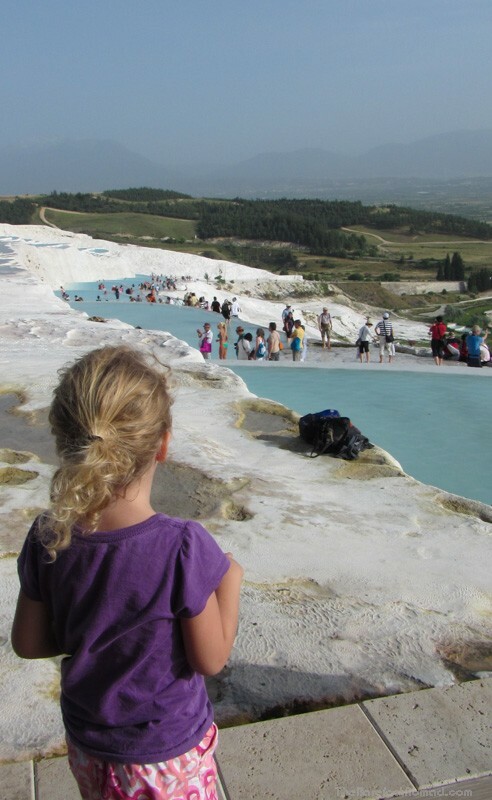 There are two entrances to the Pamukkale travertines; one at the top at the ancient town of Hierapolis and a less used entrance at the bottom of the travertines in the town of Pamukkale itself. You can buy tickets that give you access to both the travertine pools and the Hieropolis at either gate, but access to the ancient Roman baths at the top is extra. The top Hierapolis entrance is the one most favored by large tour groups, so you’ll encounter most of your fellow tourists near the top of the travertines and it’s by far the busiest section. Most people who choose the upper Hierapolis entrance only get about halfway down the travertines (at most) before climbing back up. The deepest and busiest pool is also one of the closest to the top. All this means is that the bottom of the travertines are quieter than the top. As an added bonus, the rock at the bottom pools is whiter. That said, the view from the top is beautiful so if you have the opportunity, it’s worth the trip in either direction. By Bus: Several bus lines arrive from almost all parts of Turkey. Most with connections at nearby Denizli town, the closest large regional center to Pamukkale. We took a six hour bus ride from Bodrum, Turkey to Denizli. From Denizli, we took a 20 minute minibus (dolmus) to Pamukkale itself (3 Turkish Lyras a person and kids were free with drop locations all around the town). In general, bus service is reliable, and well used both by Turkish nationals and tourists. The bus terminal in Denizli is huge and on the outskirts of town however there are numerous cafeterias, a nice playground and facilities to kill time if you’re waiting for your bus to arrive. By Air: Denizli town has a small airport where you can catch flights to and from Istanbul’s Sabiha Gökcen or Atatürk airports. There’s also a direct flight from Ankara or you can fly into Turkey biggest international resort Antalya or Izmir and take a day tour to Pamukkale. By Train: No trains serve Denizli town (or Pamukkale). Where to stay: There are numerous budget hotels located in Pamukkale town itself however there aren’t a lot of high end ones. Most are within easy walking distance to the bottom gates and a few have amazing views of the travertines in the morning or at night when the hills seem to glow in the darkness. 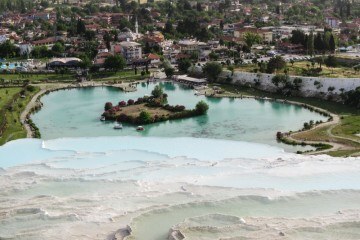 You can check out the hotel selection (about 40 hotels) for Pamukkale on Agoda.com. 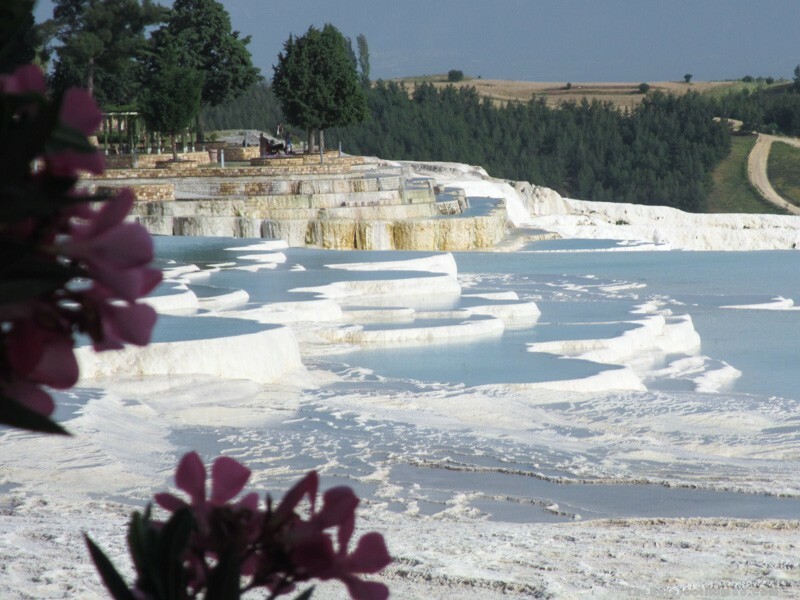 If you’re looking for a tour that will help you navigate Pamukkale and Hierapolis, Viator offers a few highly rated and popular private options. 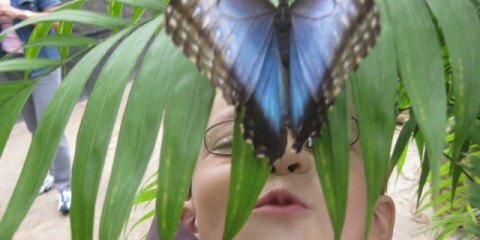 You can even opt for small group or private tours. Check out details on Viator here. 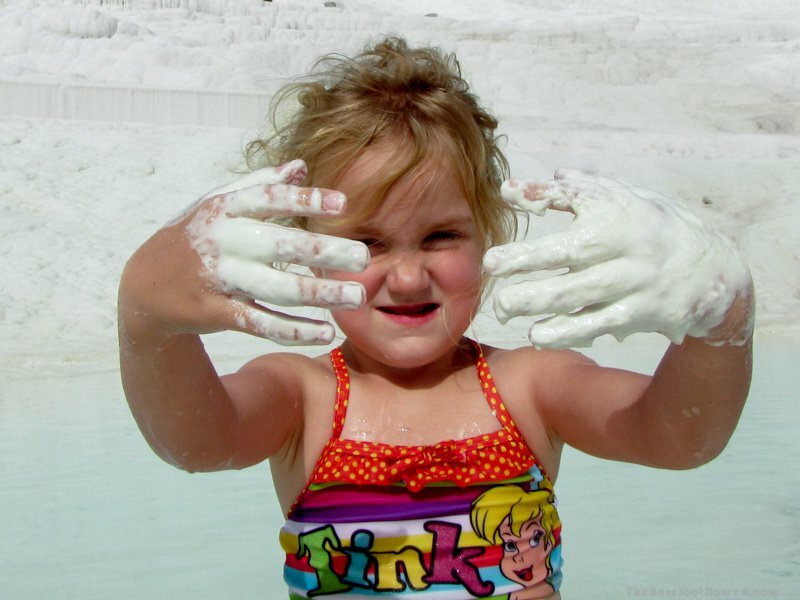 Where: Pamukkale is in the south west corner of Turkey in the Denizli Province. 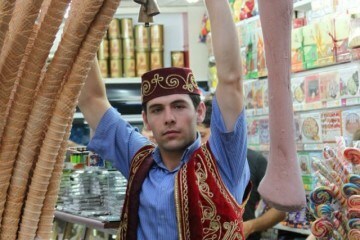 Who Wants to Fly to Turkey for Ice Cream? Great information here about the natural hot water travertines! It indeed looks like a cotton candy.. great photography. HOW Cool is this?!! I have seen photos but none up close. I’d like to go! We’ve got quite a few charcos, natural pools, over here in Gran Canaria. And they sure do a mean jacuzzi impression when the Atlantic rushes into them. We much prefer them to a hotel spa. I was bummed to not get to explore more of Turkey when I went – what a beautiful country! This is so on my bucketlist! I’ve always wanted to visit Turkey, but haven’t been yet. Looks like there is just so much to do there! Thanks for providing such a detailed guide to the hot springs! 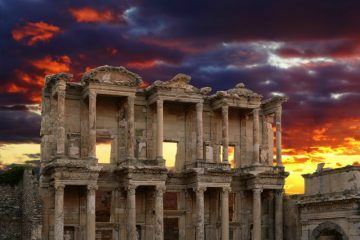 If/when I go back to Turkey, I have to go here! Great information, the pictures look amazing. The warm running water looks so inviting! I’m glad the Turkish government has taken steps to reduce the environmental impact of tourists. Thanks for sharing your pictures of these beautiful cotton candy hills! Bookmarking this post. I’d always wanted to go there, but I didn’t know that people can actually swim or walk on it. Now I want to go all the more! Yes, I loved that we could spend so much time playing in the water. And the views were gorgeous! Yet another spot to add to my must-see list 🙂 Such a cool-looking place – I’ve never seen a hot spring that looks like that! 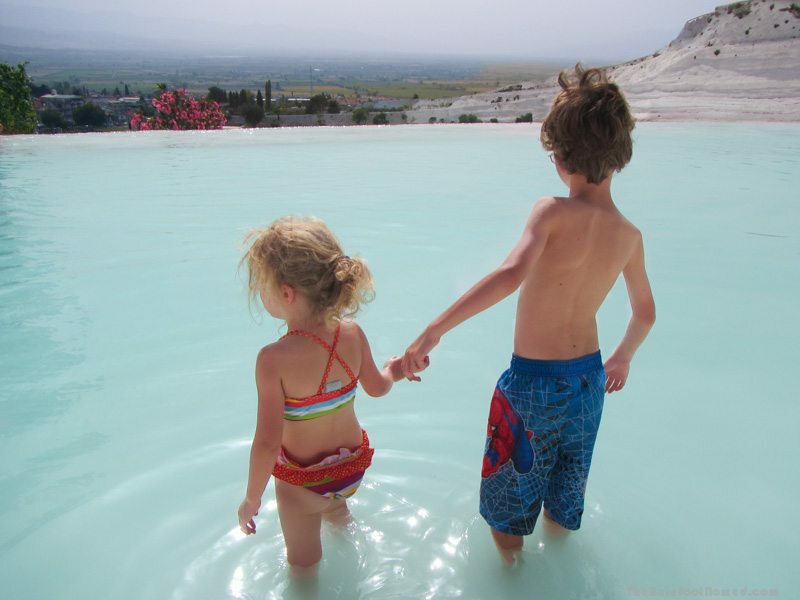 We haven’t seen a hot spring like Pamukkale either. I’d highly recommend going if you can. I wish the development around a Niagara Falls had been stopped in the same way. It looks like a beautiful day in a geologically interesting area. Yes, we were at Niagara Falls last year, and I was surprised how many buildings and hotels were near. Not quite what I expected. What a spectacular setting. And great to know conservationists have stepped in to see that the tavertines’ extraordinary beauty can flourish without roads and excessive building. I never knew this existed. It looks so fun!!!!! I never knew this existed before! Every traveler I talk to speaks so highly of Turkey, and this is just one more reason to add it to my bucket list! This looks amazing! My kids would be all over that gucky stuff (or it would be all over them, rather). Ha, our kiddos were covered head to toe in it. Luckily, it just felt like wet chalk, and rinsed right off. This looks AMAZING! I was thinking Turkey would be a good mom’s trip destination, but now I have to take my kids – they’d LOVE this! Wow– how incredible! I confess to never having known about the travertines….adding this to my must see list. Wow, this is spectacular! I know have a new destination on my bucket list. Thanks, I think. 🙂 This really looks incredible and I see the kids had a great time as well. 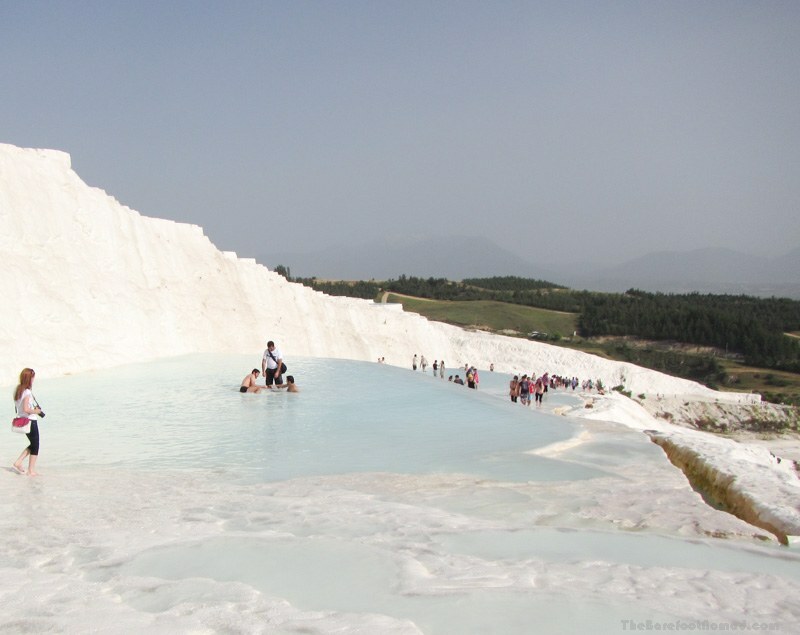 I’m so torn about whether I should include Pamukkale in my itinerary. I read in another blog post that the travertines were mostly dried up and therefore underwhelming. I guess it depends on the time of year? Great post and amazing pictures! We spent time there too. Yeah – I am due to go back this month – Can’t wait! The blue and white colors are simply beautiful. Such a unique set of hot springs! Pammukkale is indeed the stuff that dreams are made of. The blue waters seamlessly merge with the white shores to create a mesmerizing effect. 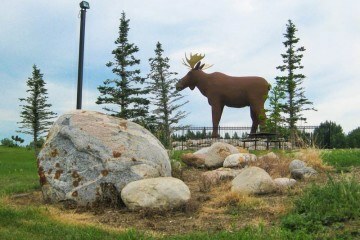 Your pictures are stunning and have lovingly captured the beauty of the place. 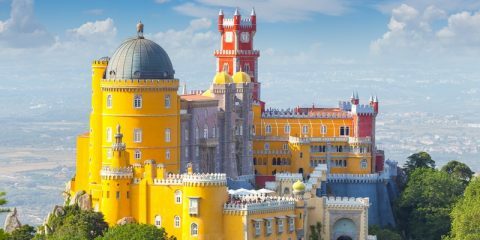 Apart from the natural charm of the place what fascinates is the history of the region and the fact that the place was a Spa city even in ancient times. These pools look incredible, as do the cleopatra ones. I’d definitely be staying the night to watch the sunset too, bet it’s magical!